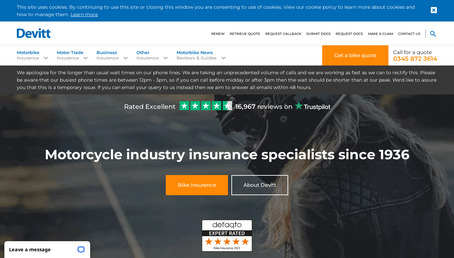 Specialising in motorcycle insurance since 1936, Devitt understands bikers and their policy needs. Whether you’re a biking fanatic or an occasional rider, find the best value cover for you with Devitt. Get quotes today for business, car, van, home, dealer or motorcycle insurance online.